According to researchers at the Economic Policy Institute (EPI), a Washington, D.C.-based liberal think tank, the top 1 percent of American families took home approximately 26.3 times as much income as the bottom 99 percent in 2015— a 4 percent increase from 2013. The report titled “The New Gilded Age: Income inequality in the U.S. by state, metropolitan area, and county,” is authored by Estelle Sommeiller, socio-economist at the Institute for Research in Economic and Social Sciences in France and Mark Price, an economist at the Keystone Research Center in Harrisburg, Pennsylvania, who warned about the alarming trends in income inequality spreading across the country. Researchers used the latest government data to analyze how the top 1 percent and the bottom 99 percent in each state have fared from 1970 to 2015 by county and metropolitan area. This analysis reveals vast and widespread growth in income inequality in “every corner of the country,” said the report. Growth in incomes of the bottom 99 percent has slightly improved since the last report. However, the gap between the top 1 percent and bottom 99 percent in the majority of states is severely widening. To be in the top 1 percent nationally in 2015, a family needed an income of $421,926. 13 states plus the District of Columbia, 107 metro areas, and 317 counties had local top 1 percent income thresholds above that level. The highest thresholds to be in the top 1 percent in states were in Connecticut ($700,800), District of Columbia ($598,155), New Jersey ($588,575), Massachusetts ($582,774), New York ($550,174), and California ($514,694). From 2009 to 2015, the incomes of the top 1 percent grew faster than the incomes of the bottom 99 percent in 43 states and the District of Columbia. The top 1 percent captured half or more of all income growth in nine states. Jackson, Wyo.-Idaho was the most unequal metro area, followed by Naples-Immokalee-Marco Island, Fla., and Key West, Fla. The most unequal counties were Teton County, Wyo., New York County, N.Y., and La Salle County, Texas. Overall in the U.S., the top 1 percent took home 22.03 percent of all income in 2015. That share was just 1.9 percentage points below the 1928 peak of 23.9 percent, which preceded the Great Depression. While the rich are getting richer and the poor are getting poorer in the United States, President Donald Trump took to Twitter last month to brag about the economy. Calling it the “greatest” on record, which we ask: What economy (financial economy or real economy) was he referring to? 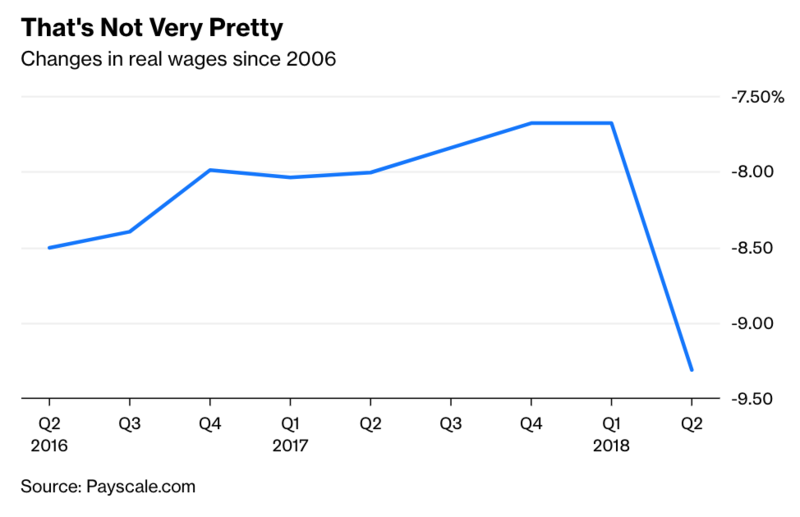 President Trump’s debt-fueled tax reform package [stealth QE for corporations] was supposed to raise wages and spur hiring for the bottom 90 percent has instead funded a record stock buyback and dividend spree, benefiting investors and company executives over the American worker. In other words, President Trump has allowed income inequality in the U.S. to widen further.